2.0 GHz or 2.16 GHz MacBook Pro? Apple has determined that certain lithium-ion batteries containing cells manufactured by Sony Corporation of Japan pose a safety risk that may result in overheating under rare circumstances. The PowerBook serial number is located on the side of the battery well in the top left corner. The iBook serial number is located underneath the keyboard. Or, you can use Apple System Profiler to confirm your serial number. It may take up to 4 to 6 weeks for your replacement battery to arrive. Shipping time may vary due to availability of your battery model. Apple will send you the replacement battery first and then you will send Apple the recalled battery. Before you count yourself out of Apple's recent battery recall, have another look at the Battery Exchange Program iBook G4 and PowerBook G4 on Apple's site - the list of recalled batteries has changed since it was first reported. Battery Cell Manufacturer: Sony Energy Devices Corp., of Japan Computer Manufacturer: Apple Computer Inc., of Cupertino, Calif.
Sold Through: Apple's online store, Apple retail stores nationwide, and Apple Authorized Resellers from October 2003 through August 2006 for between $900 and $2,300. The batteries also were sold separately for about $130. Consumer Contact: Contact Apple at (800) 275-2273 between 8 a.m. and 8 p.m. CT Monday through Sunday or log on to Apple's Web site at https://support.apple.com/batteryprogram to check the battery's serial number and request a replacement battery. In conjunction with the U.S. Consumer Product Safety Commission, Apple Computer announced a voluntary recall of lithium ion battery packs used in certain Apple notebook computers. The recalled packs contain battery cells originally manufactured by Sony. Sony is committed to the safety of consumers and supports this recall by our customer Apple. At this time, Sony anticipates no further recalls of battery packs using these particular battery cells. The recall arises because, on rare occasions, microscopic metal particles in the recalled battery cells may come into contact with other parts of the battery cell, leading to a short circuit within the cell. Typically, a battery pack will simply power off when a cell short circuit occurs. However, under certain rare conditions, an internal short circuit may lead to cell overheating and potentially flames. The potential for this to occur can be affected by variations in the system configurations found in different notebook computers. Sony has introduced a number of additional safeguards into its battery manufacturing process to address this condition and to provide a greater level of safety and security. We believe the issue has been addressed to the satisfaction of our customers. Sony currently estimates that the overall cost to Sony in supporting the recall programs of Apple and Dell will amount to between 20 billion yen and 30 billion yen. This overall cost is an estimate based on the costs of replacement battery packs and any other related costs to be incurred by Sony. "The recall of nearly six million Dell and Apple laptop batteries brought to light what has long been the tech industry's dirty little secret: The batteries that power our laptops, wireless phones, iPods, and cameras are potential incendiaries. The risk of your laptop bursting into flames is low, and it is much lower for other devices. But it is real, and it's not going away. "An Austin company called Valence Technology does make a lithium battery with different chemistry that is safer because its reactions don't produce fire-sustaining oxygen. The downside is that these batteries provide significantly less power for a given size and weight." "In light of Apple's and Dell's massive recalls, will computer makers opt for batteries that are less prone to catching fire? "Lithium-ion batteries are widely used in laptops, cell phones, and other mobile devices because of their ability to store lots of energy in a small, light package. But with a recent spate of incidents in which these batteries overheated or burst into flames - prompting recalls of Sony batteries in Apple computers and more than four million Dell laptops - many experts are questioning their safety. "A solution may be at hand, although it could mean accepting, for now at least, lower battery capacity. Safer materials for lithium-ion batteries already exist and are available in products such as power tools. With some modification, they could be used in laptops, and also help facilitate the widespread use of lithium-ion batteries in hybrid and electric vehicles. "Leading the way are two companies, A123Systems of Watertown, MA, and Valence Technology of Austin, Texas, which have designed lithium-ion batteries that avoid the traditional positive electrode materials used in most laptops and cell phones today." "The Japanese government said Tuesday that it knew of one case in Japan of a Sony made battery used in an Apple Computer notebook overheating and catching fire. "The incident, resulting in a minor burn to the person's finger, happened in April. "The government said last week there had been two cases of Sony-made batteries used in Dell notebooks catching fire in Japan, but no one was injured." "A Qantas spokesman told APC this afternoon that the company was seeking further information on the precise risk posed by the batteries in Apple PowerBooks and iBooks, and whether they posed the same risk as Dell batteries." "I've always had a weakness for stationery, and the end of August is when it's worst. I can get lost in a drugstore's overstocked aisles of back-to-school gear for half an hour or more looking at notebooks and art supplies, reminiscing back to that transitional window between summer and fall. "But students today are just as likely to find themselves bathed in the LCD glow of the computer aisles of electronics chains. The question of which computer to take to school has become more important than which type of pens to buy. "In years past, I'd suppress my inner Mac booster and point out that you should weigh the school's operating system suggestions (which typically means Microsoft Windows) in your deliberations, and I'd note in fairness that a Windows laptop can be better suited for some people. "Boy, am I glad I don't have to do that anymore. "A sad story to tell this week as one user, Nemin, has recently had his PowerBook G4 stolen. Of course things could have been a lot worse for him, but losing a computer can be quite painful for many, especially if your business or school rely on you to have that computer. However, he seems to have gotten over the worst and is now on the prowl for a replacement, the MacBook Pro. "I'm sure many potential Mac buyers will wonder where the difference lies between the MacBook Pro 2.0 GHz and 2.16 GHz versions, especially with a $500 price tag increase on the latter. For many it's a case of what they'll want the system for, which at the end of the day, can only be decided by the buyers themselves. But this week Haye321 and myself give a little buying advice." Link: MacBook Pro 2.0 or 2.16 GHz? "If your MacBook shuts down without warning, a new Web site says that you may not be alone. "The site, macbookrandomshutdown.com, is dedicated to the random shutdown problems encountered by the owner of a 2 GHz MacBook purchased in the summer of 2006. "About four weeks after it arrived, the MacBook began randomly shutting down without explanation. So, Matthew Swanson of Atlanta, Ga., decided to take his concerns and turn them into Web site and message board for people to post blogs and comments about similar MacBook problems." Well, my week 1 MacBook finally got around to taking a dirt nap today. Oh sure, I had the staining palmrest issue, then scratched CD issue (which ruined a perfectly good copy of WOW by the way), and the "talking" powerbrick. I was willing to live with those for a reasonable amount of time. Then last week, after the firmware update that really did make a big difference in the running temperature, I started getting RSS. Something fierce. Well you can image that this spun me to a new level of pissed that I was previously unaware of. BUT, despite how mad I was that this is the 3rd Apple laptop that had factory defects (1st was the last TiBook with the spotty screen, 2nd was the next gen PowerBook with 3 faulty logic board replacements), I will give Apple the benefit of the doubt and try to fix this through the normal process before demanding a new one off the shelf. There were 2 people in line with me with MacBooks as well . . . how wide spread is this? "If you were planning on buying an Apple notebook, you might consider waiting until Sept. 16. By this date, Apple will have held their annual Paris Expo, an event known for new product announcements - and this year, it's rumored to include a newly, upgraded Mac Book Pro." "Laptop computers, which have become a primary tool for students these days, come in so many sizes, shapes and forms - and trying to figure out which one is best for you can be challenging. "We borrowed six machines with a variety of specifications and features: the Apple MacBook ($1,099), Dell's Inspiron E1405 ($1,160), the Gateway NX260X ($1,220), Hewlett-Packard's Pavilion dv2000t ($1,225 before a $50 mail-in rebate), the Lenovo ThinkPad Z61t ($1,399) and Toshiba's Satellite M105-S3064 ($1,150). "For each, we looked at pricing, weight and power issues such as battery life, heat and noise. We checked out the design and performance of each machine, as well as the included software and number of expansion and connection ports. Finally, we sampled the tech support provided by the manufacturers. "The cheapest model in this bunch came from Apple, the $1,099 MacBook. That price, however, requires giving up the DVD-recording capability and extra memory offered by most laptops in this lineup." PR: 100% Mercury Free - Upgrade or replace your original 14" iBook G3 or G4 battery with a NewerTechnology NuPower 74 Watt-Hour replacement battery. Each new battery also includes a FREE label to return your old battery for proper recycling or disposal. NewerTech PowerBook and iBook Li-Ion Batteries are top tier and are designed, engineered, and manufactured in the USA. The actual Li-Ion cells used in all NewerTech PowerBook and iBook batteries are of the best quality and made either in Japan or Canada. This is in stark contrast to the arguably inferior battery products produced overseas with cheaper battery cells. Not only do NewerTech batteries provide more run time vs. stock Apple and others, NewerTech batteries are also built to last longer - providing more use cycles before a replacement is needed. This battery is compatible with all 14" iBooks. Adds two USB 2.0 ports to your PowerBook ! 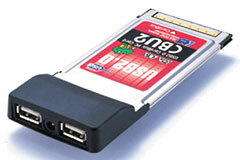 EHCI(USB 2.0) and OHCI(USB1.1) compliant host adapter CardBus PC Card. Adds two High Speed(480 Mbps) USB 2.0 ports to your laptop PC. Fully compatible with Microsoft standard USB 2.0 driver for Windows XP/2000. Included original USB 2.0 Driver for Windows Me/98SE. - Supports USB 2.0 Hi-Speed HUB. - Supports USB 2.0 Multifunction device. - Supports Isochronous transfer mode. Switches automatically to the highest supported speed of the attached USB device. Work with Apple's standard USB 2.0 driver for MacOS X 10.2.8 or later. Supports Hi-Speed (480 Mbps) with original USB 2.0 EHCI driver for Mac OS 10.2.x. Supports Low/Full Speed (1.5/12 Mbps) with Apple USB Supports drivers. Allows using USB1.1 and USB 2.0 peripherals simultaneously. Supports Plug & Play and Hot-Swapping of USB1.1/2.0 device. Available USB Bus Power up to 300mA at two ports. Bus Power adapter(AC05, sold separately) is required for 500mA at each port. PC or PowerBook G4/G3* with CardBus-enabled PC Card slot. * Except PowerBook G3 (November 1997, Machine/Gestalt ID:313). This model doesn't support CardBus slot. Please check your Machine ID at Apple System Profiler window. Refer to the FAQ. 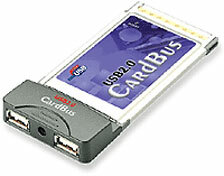 Package includes CBU2U USB 2.0/1.1 host adapter CardBus PC Card. Two USB 2.0(Type A) ports and the optional Cable Power jack. Don't let the price fool you! This Hi-Speed USB 2.0 PCMCIA Card is fully USB 2.0 compliant, supports transmission rates of up to 480 Mbps and is fully backward compatible with USB revision 1.1 devices. Installation is quick and easy; simply slide the PC CardBus card into the Type II slot on your notebook and you are Hi-Speed USB 2.0 ready!! PR: QuickerTek has announced a new 5.5dBi antenna for the Apple 17-inch MacBook Pro. This antenna more than doubles the wireless range and signal strength for $100 . With a 5.5dbi RF gain in signal strength, users can expect both a gain in the wireless range and in the signal-to-noise ratio - giving a stronger and faster wireless signal. The "boost" means you can sit a lot further away from the wireless access point or Base Station when working wirelessly. The antenna design and attachment makes it easy to attach, use and remove for maximum portability. "We've got our 17-inch MacBook Pro Antenna delivering the wireless performance that Mac users expect from their top-of-the-line 'Book. There's everything to like about the new antenna and I'm so enthusiastic about it, I take it with me every time I leave the office" said Rick Estes of QuickerTek. Like most QuickerTek products, the 5.5dBi Antenna for the 17-inch MacBook Pro is backed with a one-year warranty on parts and labor. PR: Lamp Light is a very simple app based on a simple idea - utilizing the power of your laptop (PowerBook, iBook) display to emit bright reading light. Created during an electrical storm and blackout, the app was used to shed some light on a book that could hardly be read in the dim light of a normal laptop display. It's simple - a screen displays pure white light, and you can choose your settings from battery saving low, medium to high. It's also useful when traveling on long plane flights - use Lamp Light instead of the overhead light so as not to disturb all the passengers around you trying to sleep - and other low light conditions. It may not be an app that you use much, if hardly at all, but there will be a time when you're glad to have it. "Two days after the official introduction of the Core 2 Duo Merom, the mobile version of the Core 2 Duo Conroe (not currently used in Macs yet), many websites have published tests. "The first good news is its price, identical to Yonah CPU at equivalent clockspeed. Intel will of course in the coming days decrease the price of Core Duo CPUs. "According to DisplaySearch, widescreen notebook shipments in the second quarter of 2006 exceeded a 60% share of the worldwide notebook PC market. "A milestone was achieved in the first quarter of 2006 when worldwide market penetration by widescreen notebooks surpassed 50%, a stark contrast to just one year ago, when widescreen notebook shipments were less than 35% of the total worldwide notebook market."